1686 Dapper View of Tripoli, Libya. WE SELL ONLY ORIGINAL ANTIQUE MAPS - NOT REPRODUCTIONS. 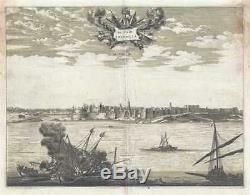 Description: This is a 1686 Olfert Dapper view of Tripoli, the capital of Libya. The view depicts the city from the sea, highlighting its formidable coastal fortifications. In the foreground, two ships appear to have collided with each other and are burning, while other ships rush to help the unfortunate sailors aboard the two stricken vessels. Although Tripoli was a hub for barbary pirates, it does not appear that this scene depicts a battle. The fortifications in the background, protecting Tripoli, belong to Assaraya al-Hamra or the Red Castle. John built the fortress after theish awarded the city and the island of Malta to the Order. As the Knights of St. This view was produced by Olfert Dapper and published by in the French edition of Description of Africa entitled Description de L'Afrique and published in 1686. Size: Printed area measures 10.75 inches high by 14 inches wide. If your address is a P. DHL International EXPRESS (45 USD). We can use your Federal Express Account. Duty varies by country and we cannot predict the amount you will be charged. Some countries are duty free, others are not. Other Services Conservation Framing: Geographicus recommends basic conservation framing services for any antique paper. We do not offer this service. Antique Map Restoration: Geographicus can repair and restore your antique map. Services include deacidification cleaning flattening and backing. The item "1686 Dapper View of Tripoli, Libya" is in sale since Friday, November 23, 2018. This item is in the category "Antiques\Maps, Atlases & Globes\Africa Maps".